Okay, so you picked a calendar and maybe even made it (or you're going to soon!! I know, I know :) oh boy do I know!). 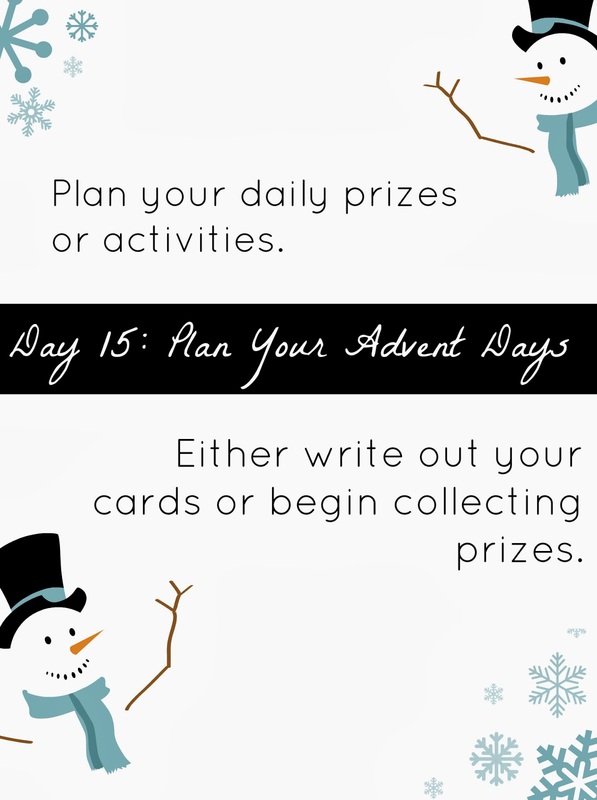 Now you've got to tackle 24 days of small prizes or activities (or both). Chances are you've got a pretty good idea where you want to go with this, and don't feel like you have to do them all in one day (maybe 3-4 a day), whether it be shopping for treasures or brainstorming activities, do whatever you need to have that calendar ready and raring to go December 1st (sans the November 30 midnight meltdown). If you're going to activity route, pull out the calendar and think of the things you know you'll be doing for sure. Things like meeting Santa, local parades or festivals, Christmas parties, and school concerts probably already have a set date, which makes it easy. Next think of the things that are more flexible datewise, but again you're certain to do. Things like mailing letters to Santa, ice skating or sledding, making Christmas Cookies, going Christmas lighting, etc. By this point you should be at least half-way full of activities, now brainstorm things to fill in like easy age-appropriate craft projects, fun holiday themed recipes, service activities. Be sure to have some real easy days, don't make them all super involved, and it might be a good idea to not necessarily number your activities (in case you need to do some rearranging!). Here's a big list of inspiration if you're coming up short! I would love to hear your ideas too! Make and leave gift for the mailman/delivery man/etc. hang an easy backdrop and have a Christmas "photo booth"
If you're lucky enough to live by a zoo, chances are they have some sort of Christmas lights to go see.